The Disunited States of America: Why demographics, Republican obstructionism, and election cycles may lead to a generation of political stagnation. Gridlock is only a symptom. Why our democracy may be hardwired to fail for a generation. 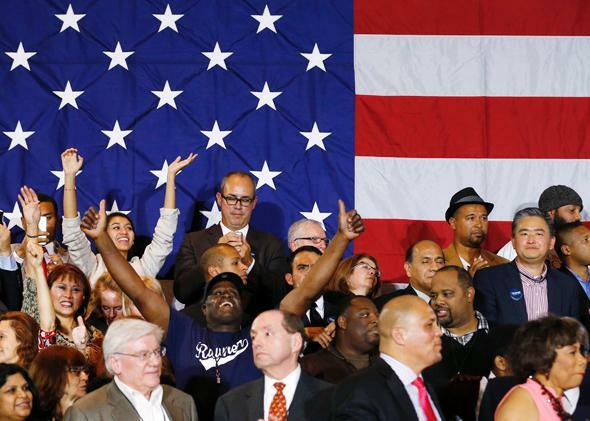 A crowd reacts to midterm elections returns in Chicago on Nov. 4, 2014. The Republican Party scored a landmark victory on Tuesday night. The GOP didn’t just win the safe bets in South Dakota and the mildly competitive races in Kentucky, Kansas, and Georgia. It triumphed in North Carolina, Colorado, and Arkansas—where conservative candidates knocked out Democratic incumbents—and Iowa, where it won an open seat previously held by veteran Democratic Sen. Tom Harkin. Republicans saved embattled governors from defeat and scored upset gubernatorial wins in Maryland, Massachusetts, and Illinois. And, to finish the hat trick, House Republicans are on track to win their largest majority since 1928. But before we declare the end of the Obama era, we shouldn’t lose sight of something else, even if it runs afoul of the headlines of the past week: Nationally, the Republican Party isn’t popular. According to a recent Pew Research poll, 54 percent of Americans have an unfavorable view of the GOP, compared with 47 percent who feel the same for the Democratic Party. The people who just elected a Republican majority in the Senate are a narrow, unrepresentative slice of voting-age Americans. They’re older, whiter, wealthier, and much more conservative than the public at large. Put another way, the midterm electorate that chose this Republican Congress is itself a Republican electorate drawn from a subset of Republican voters. And two years from now, when we gather to choose the next president, it’s just as likely we’ll have a Democratic electorate—voters who are younger, less affluent, and more diverse—choosing a Democratic president. In other words, the 2014 to 2016 cycle will be a rough copy of the 2010 to 2012 cycle. This is more than a quirk of American elections. It represents a major shift in partisan cycles that, in turn, has serious consequences for our ability to govern the country and respond to the pressing problems of the day. With this seesaw of Democratic presidents and GOP congresses, we may be facing more than gridlock. We may be on the cusp of a generation of political stagnation that will be hardwired into our democracy by our country’s shifting demographics and the unwillingness of the Republican Party to compromise with those with whom they disagree. Midterms have always been bad for the president’s party, but rarely were they wave elections—or near waves—of the kind we saw this year and in 2010. Instead, they were modest shifts in one direction or the other. In 1986, running at the end of Ronald Reagan’s term, Democrats won a net five seats in the House of Representatives and eight in the Senate. In 1990, running against President George H. W. Bush, Democrats won a net seven seats in the House and one in the Senate. In other words, until very recently, Democrats didn’t always fare poorly in midterm elections. The generational divide in partisanship, for instance, didn’t exist 25 years ago, or at least, not in the same way. Take the 1988 electorate that chose Bush for president. There, Michael Dukakis won roughly the same share of seniors (49 percent) as he did voters younger than 30 (47 percent). Four years later, Bill Clinton won 43.5 percent of voters younger than 30 and 50 percent of voters 65 and older. If there was a generation gap, in other words, it was that older voters favored Democrats, not Republicans. The main difference between young and old voters back then wasn’t whom they voted for as much as whether they voted in the first place. Grandfather and Grandson might vote for the same party, but the grandfather would show up for every election while his grandson was more likely to only vote every four years in a presidential election. That divide still exists. According to early exit polling, 37 percent of voters in this year’s election were 60 and older, compared to 12 percent who were under the age of 30. What’s different compared with the past is the partisan divide. Simply put, when young people go to the polls they vote for Democrats and when older people cast their ballots, they vote for Republicans. And the gap is huge. In 2008, Barack Obama won 66 percent of voters younger than 30 compared with 47 percent of voters 60 and older. Likewise, in the Republican wave election of 2010, congressional Democrats suffered their largest losses with older voters and had their best performance with the millennial generation. In 2012, President Obama gave a repeat performance on both scores, winning 60 percent of voters younger than 30 and losing 56 percent of voters 65 and older. 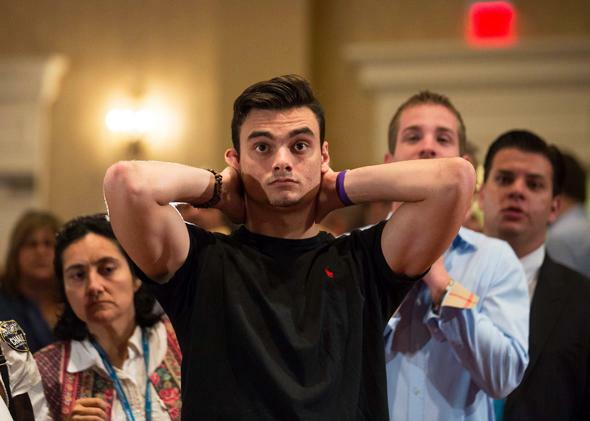 This year, Democrats won 54 percent of the youngest voters while 57 percent of senior voters went to Republicans. We’re at a point where one electorate—made up of young people and minorities—elects presidents and the occasional Senate majority while another—made up of older people, mostly white—elects the House of Representatives, with an occasional Senate majority as well. But why is there a GOP midterm advantage now as opposed to 20 years ago, when the overall electorate was substantially whiter? The answer is demographics. First, as Ronald Brownstein has argued for the Atlantic, differences between white and nonwhite voters weren’t as severe as they are now. In congressional and presidential elections, Democratic candidates performed well with minorities and decently with whites, giving them a cushion in midterm contests—yes, the electorates were older, but they weren’t as Republican. This is important. In the 1990s, a substantial number of older voters—if not most older voters—belonged to the Greatest Generation, the men and women who grew up in the Depression and fought in World War II. They were New Deal Democrats in their formative years, and they kept that affiliation through the rest of the 20th century. 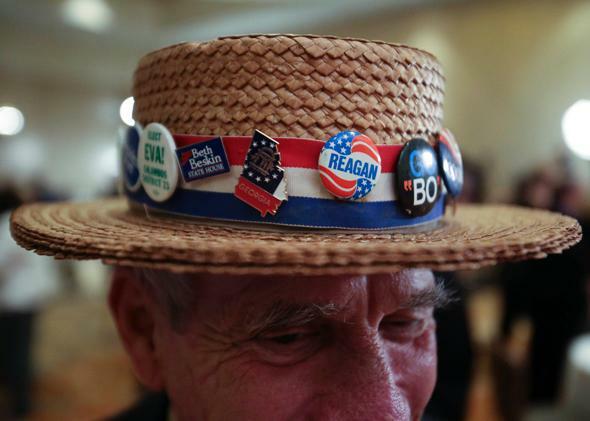 Hank Schwab shows off the campaign hat he’s worn for the past 30 years at a gathering in support of Republican U.S. Senate candidate David Perdue on Nov. 4, 2014, in Atlanta. Those political ties were evident in how they voted over time. According to a massive survey on the “generation gap” by the Pew Research Center, voters who turned 18 when Franklin Roosevelt was president were 8 points more Democratic than the average voter in 1994, 1996, and 1998; 11 points more Democratic in 2000; 3 points more Democratic in 2002; and 14 points more Democratic in 2004. By contrast, the next oldest cohort of voters—those who “came of age” during the Truman and Eisenhower administrations—were substantially more Republican in most years. The generation gap as we know it—when the oldest voters jumped to the Republican Party and the youngest became solidly Democratic—didn’t emerge until the 2004 election. That was partially because of the circumstances of that contest—President George W. Bush was running a campaign of national unity against foreign threats. It is also explained, again, by demographics. The Greatest Generation had shrunk and was in the process of being replaced by senior citizens who were much friendlier to Republican politicians. At the same time, the youngest voters—people who turned 18 during the late Clinton and early Bush presidencies—were just entering the electorate. They were much more diverse, with large numbers of black Americans, Latinos, Asians, and mixed-race people. They were also more likely to be single and to be women, and not surprisingly, they were also far more liberal than their older counterparts. In that same Pew survey, we see that voters who turned 18 during this period were 13 points more Democratic in the 2002 congressional elections. Interestingly, in 2004 voters who came of age during Clinton’s presidency were 7 points more Republican, while those who came of age during Bush’s were 14 points more Democratic. As we entered the 2000s then, we had several trends coming together at once. The overall voting population was getting younger and browner, and these new voters were more Democratic; older voters, however, were still whiter and becoming more Republican. And young people continued to vote in presidential elections and largely ignore the midterms, while the older generation was consistent, voting in almost every election. Tuesday’s election was further proof for the case. Democrats did well with their constituencies, but they weren’t large enough to save the Senate. And Republicans cleaned up with older and white voters, crushing Democratic opponents across the board. There’s still a lifetime of politics before the 2016 presidential election. But it’s fair to say that our demographics will continue along this path, giving us a baseline that favors Democrats and the eventual Democratic nominee. Which means that for the next two years, and the two years after that—and the two years after that—we should expect divided government. On its face, this doesn’t have to be a bad thing. Yes, as a partial product of these demographic shifts, the parties have all but diverged. The Republican Party is a conservative coalition and the Democratic Party is a liberal one. But there’s nothing about these polarized, ideologically distinct political parties that necessitates the stasis or gridlock that we’ve seen since 2011, when Republicans took the House majority. You can still have cooperation even if both sides are working from different places. Kentucky Sen. Rand Paul and New Jersey Sen. Cory Booker are on opposite sides of the spectrum, but they can work together on shared concerns like mass incarceration. In the same way, liberals who want a stronger safety net can work with conservatives who want fewer programs to craft something that satisfies both concerns, like a stronger earned income tax credit. If this sounds ludicrous, you only have to look to the Newt Gingrich–era of Congress to see an instance of polarized parties crafting shared legislation. The problem for our present politics isn’t ideological division; it’s that the Republican and Democratic parties aren’t ideological in the same way. The Republican Party isn’t just more conservative and more polarized, it’s polarized against basic norms of compromise. That began with President Obama. From the moment he entered office, House and Senate Republicans mobilized against his administration, denying votes to all administration initiatives and forcing the Senate into a super-majoritarian institution through use of the filibuster. Legislation couldn’t pass—and nominees couldn’t win confirmation—without 60 votes, an unprecedented turn in American governance. Incoming Senate Majority Leader Mitch McConnell answers questions during a press conference at the University of Louisville on Nov. 5, 2014, in Louisville, Kentucky. Part of this was strategy. 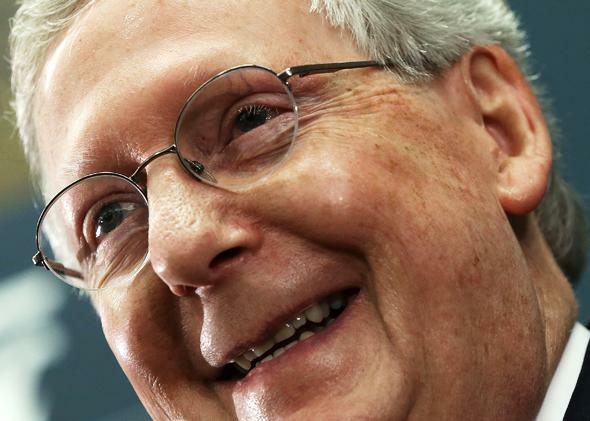 GOP Senate leaders like incoming Senate Majority Leader Mitch McConnell understood that voters don’t care about congressional squabbles and exact lines of responsibility. The public judges the president on conditions like economic growth and heuristics like bipartisan cooperation. If Congress isn’t working together—if Washington seems polarized—voters don’t blame the responsible party as much as they blame the president. But part of it was also pressure from the older, white base of the Republican Party, which demanded full opposition to the president. The summer of 2009 was marked by vitriolic “town halls” where Democratic lawmakers faced a furious backlash from voters angry over the comprehensive health care bill. This anger—and these voters—gave the GOP a series of electoral wins, beginning with Sen. Scott Brown’s election in Massachusetts and ending with a Republican House majority in the 112th Congress. That House majority would exemplify the anti-compromise ethos of the Republican base, lurching from crisis to crisis in an effort to stymie the Obama administration. In the summer of 2011, for example, House Republicans killed a proposed “grand bargain” over entitlement cuts and tax increases—pushed strongly by the president—and threatened a damaging debt default in return for massive cuts to federal spending. Liberal commentators denounced this as “hostage taking” and nihilism. The founders, wrote Michael Tomasky for the Guardian, “did not assume … that one side could become so nihilistic that it could be willing to see the country suffer as long as the blame for the suffering could be fixed on the other guys.” It was an understandable (and correct) reaction. With the grand bargain, Obama offered major concessions, including cuts to Medicare, Medicaid, and Social Security. If Republicans could concede on tax increases, they’d score a huge policy win. They couldn’t. Instead, they used the debt ceiling to threaten economic catastrophe. Republican voters were pleased. This is what they wanted: a GOP that wouldn’t bend. “America is rising back up and getting a backbone again, and making our voices heard one way or another, whether it’s Tea Party, or whatever else. People are being emboldened,” said one woman—an evangelical Christian voter from Colorado—in a focus group conducted by Democracy Corps, a liberal-leaning group. This attitude is how we got the now-infamous scene from the 2012 Republican presidential primaries, where a whole suite of candidates refused to endorse a fiscal deal weighted in their favor, where Democrats offered $10 in spending cuts for every $1 in new taxes. And it’s also responsible for former House Majority Leader Eric Cantor’s stunning loss to an obscure challenger in the 2014 congressional Republican primaries. His opponent, libertarian Dave Brat, had a single charge: Cantor was too friendly with Democrats. It worked. 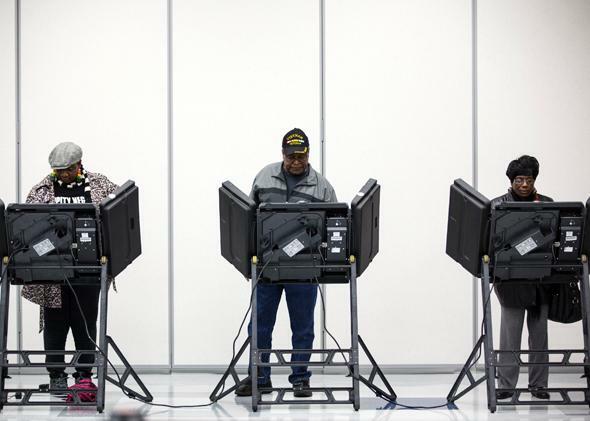 Voters cast their ballots in the midterm elections in Ferguson, Missouri, on Nov. 4, 2014. All of this is to say one thing: The GOP is broken. And with its dominance in midterm elections, it’s poised to break American government for the foreseeable future. The 2013 shutdown—when House Republicans shuttered the government over the Affordable Care Act—is just the beginning. Indeed, there’s a good chance the 2014 midterm election results will worsen the ideas and factions that brought us to the brink. For extremist Republican figures like Sen. Ted Cruz (and now Sens. Joni Ernst and Tom Cotton), the confrontations of the past two years were a success. They vindicate a stance of implacable opposition. Far from cooperation, we should expect two years of even worse dysfunction. And it’s not clear when that will end. Let’s do a quick forecast of the next few election cycles. In 2016, if the economy is growing and the electorate is more diverse, we can expect—or at least, fairly predict—a Democratic win for the White House. And since that’s the year Republicans are defending Senate seats in blue states like Pennsylvania, Wisconsin, and New Hampshire, we can also expect a Democratic Senate. In 2018, however, the picture flips. Not only will the Republican electorate return en masse, but Democrats will be defending 25 Senate seats—several in red states—while Republicans will be defending just eight. We’ll likely get another Republican Senate, leading into another presidential election, where the incumbent Democratic president has a good chance of winning re-election and bringing a Democratic Senate with her. This whole time, because of the size of the Republican House majority and its base in the rural and exurban parts of the country, the House will remain in GOP hands. This past year, frustration with congressional inaction on immigration—and public pressure from immigration activists—pushed the White House to float the possibility of taking unilateral action to create a path to citizenship for unauthorized immigrants. The result was a primal scream from conservatives, who accused the president of flouting the Constitution. Even more moderate Republicans, like Ross Douthat of the New York Times, warned of presidential “Caesarism.” And while the Obama proposal fell within the president’s authority, it’s also true that Republicans weren’t completely wrong. There is a point at which presidential action violates congressional prerogatives. Which is to say that divided dysfunctional government can have other, more dangerous consequences. Next year, Republicans will have a duly elected congressional majority. But Barack Obama will still be president and will still have the legitimacy of a presidential election. Let’s say Republicans refuse to fix a legislative problem—like a fatal wound to the Affordable Care Act, inflicted by the Supreme Court—and President Obama decides to fix it unilaterally, with executive authority, rather than let his namesake law fall to pieces. By the letter of the law, this is illegitimate. But the Republican majority wasn’t elected by a clear majority of the American people, Obama was. And the president is committed to preventing an insurance death spiral or broken exchanges that could result from a full attack on the law. Whose authority is more legitimate? I don’t expect this to happen in Obama’s final two years in office, but it’s not an idle question. If a new Republican majority stymies a Democratic president in 2019—refusing to, for example, confirm a Supreme Court nominee—we could find ourselves in a constitutional crisis, as the president acts despite Congress. The longer the Republican Party stays on its path of anti-compromise, the more likely these scenarios become. There’s a chance this predicament will solve itself. Twenty years from now, midterm electorates might be so diverse—filled with people who cut their political teeth during the Bush and Obama years—that Democrats regain the momentum in these off-year elections as well. But I wouldn’t make that bet. To take us off this path, someone—and I mean the Republican Party—will have to take action. One choice is to abandon the norm against deals, or marginalize the anti-deal makers in the Republican Party. This happened before—during the 1980s and 1990s—and it can happen again. After all, the anti-compromise norm isn’t universal among conservatives. With notable exceptions—like Texas Sen. Cruz—Republicans with statewide constituencies are more amenable to compromise than their House counterparts. If Republicans do have a durable, long-term majority in the House, then the GOP Speaker should have space to buck hardliners in favor of pragmatists and violate the informal rule that Republicans need a majority of the majority to move with legislation. The current speaker, John Boehner, has done this two times without serious consequences. A future speaker could be even bolder and block hardliners altogether. Often, trends don’t change political parties, individuals do. And they do so with the heft of the White House as leverage—if you follow me, I can win us the presidency. That is how Bill Clinton transformed the Democratic Party in the 1990s, and it’s how a future Republican could transform the GOP and bring it into the 21st century. A person who—through ambition for national office—uses power, patronage, charm, and coercion to modernize the Republican Party and steer it from its most destructive urges. Anthony Greggo, a supporter of Democratic gubernatorial candidate Charlie Crist, reacts after results of midterm elections are called in favor of Republican Florida Gov. Rick Scott, in St. Petersburg, Florida, on Nov. 4, 2014. The other option is for Democrats just to win. Again, however, that requires substantial turnout from groups that don’t vote in midterm elections. For now and the near future—absent an unlikely major institutional change, like automatic voter registration—the Democrats are simply the party of occasional voters. But then, that might suggest another strategy for taking us off the path to political stagnation. Rather than wait for Republicans to change—or for Democrats to essentially get lucky—maybe liberals need to reorganize their politics to advocate for institutional change. If there’s been an underlying current to the Obama years, it’s the degree to which liberals have been stymied and frustrated by institutional barriers, most famously the filibuster, which helped ensure a smaller-than-needed stimulus, the death of “cap and trade,” and a ramshackle health care bill passed at the eleventh hour. In some sense, our divergent electorates are just another barrier. Which means liberals will have to find some way to account for them. Whether it’s through institutional change—a national voting holiday, for instance—or something else, we have to change the dynamics of American politics. Otherwise, we can look forward to a future of dysfunction where our government will fail to do the most basic tasks. And while we can muddle through for a little while, it’s not a condition we can survive for a generation.